The European program CULTURE “World Crisis Theatre” includes groups engaged in the performing arts coming from 7 EU countries: France, Germany, Greece, Italy and Portugal, Sweden and Iceland. The purpose of the program is the presentation of social phenomena and human behavior issues that arise as consequences of the ongoing economic crisis in Europe. The aim of this cooperation is the promotion of the tools that can shape the European identity through art. At the moment (August 2013), the partners are presenting their work at the Little Theatre of Ancient Epidaurus. The Center for Classical Drama and Spectacle of Panteion University, has been experimenting in staging performances in two ways all these years: firstly, with classic performances which were carried around Greece and Europe, and secondly, with performances that carried the message of tragedy through forms of political musical. In this second category belongs the political musical Cyclops Survival. It is a Brecht’s type adaptation of the satirical drama “Cyclops” by Euripides. Its theme is about cannibalism, not only the literal one, but especially about the political and social implications of cannibalism, as we experience it in the gloom of the current crisis. Serving this logic, the actors sometimes are being transformed into mythical creatures and sometimes in today’s struggling and suffering people. A group of men and women, from an undefined time and place are summoned by an unknown man, a Dantesque Charon, to a mysterious appointment. He asks them to take a voyage. Where the destination is, or why they should leave, he doesn’t say. Their country, like many others, was experiencing a huge crisis; all that they and their ancestors had created until now, such as the certainties of social structures and wealth, it was as though everything had crumbled, failed and collapsed. It has been years since anyone asked what had caused this mysterious disturbance, what went wrong and who was to blame. In the end they got used to it, accepting the continuing state of crisis as permanent and inevitable. It was distress, a necessity for beauty, curiosity and a desire for a new utopia that had made the group so restless that when given the chance of this voyage, it was embraced immediately as an opportunity. Their only obligation before undertaking the voyage was to discard all that they had been, until the moment of departure and to leave it all behind. “The answer,” is playing with some big questions, doubts and complaints. There are some people who eat everything and leave the rotten leftovers to the others, there are some that are consumed in unnecessary fights (losing their real purpose) and then there are those who ignore everything that happens around them having fun at parties. Among the statements of sociologists, economists, journalists, politicians and ordinary people in the streets, bars, and in statistics, the show looks for answer to this question: Do we still have time to change this course? “The Satyr Play” is a satiric examination of The Eumenides, the final play of Aeschylus’ Oresteian trilogy. The work is an audience-interactive performance about the birth of democracy. Part ancient ‘piss take’ and part reckless airing of contemporary EU taboos (money, power, and European identity). The work exposes the ‘dirty laundry’ of democracy, bureaucracy and the current debt crisis. Inspired by the trial of Orestes, triage live art collective (AU), Human Waste Theater (DE) and an ensemble of Berlin-based actors join forces with the audience to ‘play’ the judges and mythic figures of the drama. However, the true hero of the show may actually be a chicken named Bertha. Above all, The Satyr Play celebrates human foibles and Greece’s great contributions to Western Civilization (myth, theatre, democracy and olive oil). Toys, childish gods and heated arguments – welcome to the human family! Opa Mas! A jam session associating Greec, Italian, French, Portuguese and German musicians. In the lead up of the creation of The European Crisis Games in 2014, French theatre director Bruno Freyssinet present an extract of David Hare's The Power of Yes to Epidaurus Festival audiences. In the framework of the World Crisis Theatre project, this performance is presented by an ensemble of young actors from seven European countries (France, Germany, Greece, Ice- land, Italy, Portugal and Sweden) and be designed specifically for the Epidaurus theatre. In order to design the staging of The Power of Yes, Bruno Freyssinet gathered a “Think Tank” of 3 artists: Nathalie Yanoz, Xavier Maître and Grégory Veux. Confronting their skills in dramaturgy, space and music, their prepared as a team the rules of the new experience proposed on David Hare’s play. Juliette Bompoint (producer) and Julie Paule (coor- dinator and assistant to the director) made the global project possible. To perform this new version of The Power of Yes, the World Crisis The- atre project provoked the gathering of young performing artists coming from the 7 participating countries. Each partner suggested emerging artists interested in being part of a European choral experience, with an artistic/citizen dimension, and also ready to work in English, both original language of the play and of the financial system. A group of men and women, from an undefined time and place are summoned by an unknown man, a Dantesque Charon, to a mysterious appointment. He asks them to take a voyage. Where the destination is, or why they should leave, he doesn’t say. Their country, like many others, was experiencing a huge crisis; all that they and their ancestors had created until now, such as the certain- ties of social structures and wealth, it was as though everything had crumbled, failed and collapsed. It has been years since anyone asked what had caused this mysteri- ous disturbance, what went wrong and who was to blame. In the end they got used to it, accepting the continuing state of crisis as permanent and inevitable. It was distress, a necessity for beauty, curiosity and a desire for a new utopia that had made the group so restless that when given the chance of this voyage, it was embraced immediately as an opportunity. Their only obligation before undertaking the voyage was to discard all that they had been, until the moment of departure and to leave it all behind. During their journey on their way towards the unknown destination they would stop every now and then, and perform to the people telling a story of life, hoping that their mistakes would not be repeated. No one would ever know what happened to that group of people who were “exposed to all” who were charged by an ideal, a dream! Legend has it that they formed a new community, others say that they have seen them still travelling and performing...always gathering more and more people... for that new world. Collecting information and material from the street, from politics, from newspapers, from global economics to the economy of house- wives and from our hearts, we narrate slices of life, of a Dantesque voy- age, we tell the story of everyday life. Set in the “day after” our days, in a tomorrow closer than today. With: Jan Arne Looss, Katharina Nesterova, Fabian Prokein, Eva Schröer, Pia Seifreth, Lino Seyfried, and Andreas Wrosch. The Satyr Play is a satiric examination of The Eumenides, the final play of Aeschylus’ Oresteian trilogy. The work is an audience-interac- tive performance about the birth of democracy. Part ancient ‘piss take’ and part reckless airing of contemporary EU taboos (money, power, and European identity). The work exposes the ‘dirty laundry’ of democracy, bureaucracy and the current debt crisis. Inspired by the trial of Orestes, triage live art collective (AU), Human Waste Theater (DE) and an ensemble of Berlin-based actors join forces with the audience to ‘play’ the judges and mythic figures of the drama. However, the true hero of the show may actually be a chicken named Bertha. Above all, The Satyr Play celebrates human foibles and Greece’s great contribu- tions to Western Civilization (myth, theatre, democracy and olive oil). Toys, childish gods and heated arguments – welcome to the human family! Opa Mas! The Satyr Play is presented in association with World Crisis Theatre programme, Professor and stage director Yangos Andreadis of Panteion University, and under the auspices of The Epidaurus Theatre Festival. Kokkinos-Kennedy is the Artistic Director of triage live art collec- tive. She is a director, live artist, and researcher who lives and works between Melbourne and Berlin. Her performance work spans classical theatre, live art and interactive/site-specific performance. Katerina is currently developing several large-scale works with partners in Australia, Europe and Canada. In 2012 triage live art collective was nominated for a Green Room Award for An Appointment with J Dark (Arts House season 2012), in the category of Outstanding Production for Audience Agency. Andreas Wrosch is an actor, writer and stage-director with almost thirty years of experience as a theatre artist. As an actor Andreas has worked for numerous German theatre companies including Theater Dortmund and his stage roles have included everything from Greek drama, to Ibsen and contemporary works. Andreas regularly partici- pates in international cooperation projects as an actor, writer and direc- tor. He speaks several including German, Turkish, Spanish, and English and teaches the Argentine tango. The Satyr Play ensemble comprises the following Berlin-based performers; Jan Arne Looss, Katharina Nesterova, Fabian Prokein, Eva Schröer, Pia Seifreth, Lino Seyfried, and Andreas Wrosch. triage live art collective - www.triagelivartcollective.com is a Melbourne based company of theatre and live art performance makers who create works in Australia and internationally. The company comprises director, dramaturge and writer, Katerina Kokkinos-Kennedy, performer and writer Melanie Jame Wolf, and designer Thomas Kokkinos- Kennedy. Triage continues to work with a range of artistic partners and associates and recent works include An Appointment with J Dark, Strange Passions, Her Name Was Lola, and The Medium. Human Waste Theater is the company of Andreas Wrosch a freelance actor, writer and director based in Berlin, Germany. Andreas’ work includes text-based theater and devised performance. With Human Waste Theater Andreas is developing several local and international projects in 2013/15. Slogans concerning the world and the Greek crisis have become a cliché for many recent shows and declarations of theatre people to the press. Yet dealing with crisis in theatre in a way that goes beyond aphorisms and slogans is both important and difficult. This kind of effort has been the motive that has led groups from seven European countries to cooperate in the World Crisis Theatre program, while it is expected that for 2014 their number will exceed the number of ten. The first phase of our common work has now come to conclusion with five representa- tions at the small ancient theatre of Epidaurus from 23 to 25 August. 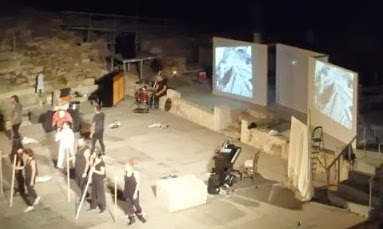 The same groups plus five more from Great Britain Spain, Sweden, Is- land and a second from Portugal have met on the island of Sifnos, as guest of the local City Hall, at the excellent Cultural Centre or Artemo- nas and have organized workshops that produced ten shows five of which are now presented at Epidaurus. The Panteion Drama Centre has taken the initiative to propose Sifnos and Epidaurus as places to host the WCT project in Greece. The Epi- daurus event has been supported by the Greek Ministry of Culture and is under the auspices of the Greek Festival. The play the Drama Centre presents is called “Cyclops’ survival”. It is a remake of the satirical drama “The Cyclops” by Euripides in the form of political musical centered on the political and economic aspect of cannibalism and draws feely, besides the satirical play, from Homer, Hesiod and Swift. This play constitutes the Centre’s contribution to the 23-25 August Epidaurus event. The Centre has worked in the field of the interpretation of ancient drama following two different yet complementary lines. Representations in a classical form that have toured Greece, Cyprus and other places in Europe; and others that have tried to approach the classical message through forms akin to the political musical. The musical Cyclops’ survival belongs to this second category and it aims at combining ancient forms with a brechtian inspirartion. The words of the ancient Greek poet, Hesiod, saying in his “Works and days” that a man should never devour another man seems to be a political and cultural message that nowadays Greece, Europe and the whole world need desperately. All these years, Drama Centre has experimented with two kinds of per- formance: first, the classic type performances that made tours around Greece and Europe, from Thrace and Cyprus to Cadiz and Lisbon, and secondly with performances that carried the message of the tragedy through the form of political musical. In this second category belongs the political musical “Cyclops’ Survival”. It is a Brecht’s type adaptation of the Euripides’ satirical drama “Cyclops”. Its theme is about cannibalism, not just literally, but mostly in the political and social implications, as we experience it in the gloom of the current crisis. Within such logic, the actors of the play are transformed sometimes into mythical creatures and sometimes in today’s sufferers and struggling people. A RESPOSTA – The Answer plays around some big questions, doubts and accusations. There are some who eat everything and leave the rotten leftovers to the rest, there are some who loose themselves in unnecessary fights (losing their real purpose), and then there are those who ignore everything that goes on around them, while having fun at a party. At a moment when we can’t see or know who the “enemy” is, or “who” oppresses us or who is taking away our fundamental democratic rights... this moment becomes our performance. For this we must go back to the birth place of democracy, to Greece, and to a moment in which, ironically, we must also point to its death. We have been influenced by texts from Plato and Aristophanes in order to play around with ideas of demagogy, corruption, inertia, electoral blindness, decisions made by incompetent and greedy people, where the “good politicians” get lost in the thick and confusing webs of unmeasured power games. Between the statements of sociologists, economists, journalists, politi- cians and ordinary people that we found on the streets, at bars, but also in statistics (“and how they like statistics!”), we thought – or better, we felt – that this performance could go that way: pointing out signs of im- potence, where the democracy and Europe look like a pressure cooker, but where there’s always space for just a little bit more austerity, a few more measures to attack the ones that already have nothing. Between the competence of making growth possible and the malpractice of ma- king entire economies disappear, the slippery slope of values and ver- bs, a hiatus is established amongst the anonymous voices – those that reject the parties or organized movements. Here, where the masks that hide the faces everyone recognizes, covered by politics, parties, and au- stere laws– we are that already at the edges of democracy, no? Like at the end of the performance, we fall of the building, and the question remains: if this falls, what will become of us? Do we have the ability to learn from the past? What will become of our children? Who are without education, healthcare, or economic power? And our pa- rents, who should have retired - resting from the harshness of a lifeti- me-, what will they do now? We still have time to change this course, don ́t you think? And do not forget: cooperation, growth, fellowship, should be the original purposes. The team for this performance is a mixture between ExQuorum and coisasdocorpo regular collaborators, old acquaintances and brand new accomplices. Ana Silveira Ferreira, who developes his own research on actors work project in ExQuorum, is the portuguese World Crisis Theatre co- producer and budget manager, and production assistant of “A RESPO- STA–The Answer”. Vicente de Sá is an actor, with an approach to opera singer, who works with coisasdocorpo and ExQuorum, almost since his beginning. Joana Eliseu Cavaco is an actress and a pedagogue, that has worked already with Projecto de Investigação from Ana Silveira Ferreira a couple of times. Valter F. Nogueira is a brand new collaborator – a poet and an actor who takes his first steps, full of energy - regained from other project, the artistic residence “Sifnos Crisis”. Eduardo João Gama is a professional sound recordist and sound desi- gner based in Bristol UK. He has done work both in theatre and film. He has collaborated in previous works with coisasdocorpo; works with Reel People Films and also as a freelancer. He is also an active member of the Wildlife Sound Recording Society. Beatriz Sertório is helping with text revision and translation (in this chapter we want to kindly thank to Katerina Kokkinos-Kennedy to make a last review of these texts). We will count also on local players, as Mary Logotheti and Maria Trapali, before at Sifnos residence. Would like to thank André Mendes, a young film director who helped us in this and other projects, and who sadly passed away in a tragic car accident recently. Unfortunately he can not keep up, as planned, to Epi- daurus - but will always be present in spirit. We thus make a small tribu- te, giving him a big hug and a fraternal kiss to his parents and his dear companion of ever: Raquel. You will be forever in our memory in this and future projects ... A warm hug, thank you for everything, André. the ones from the east, the center and Britain? That were supposed to exist a long time ago. And to where will all that go now? To a new Europe? With a capital «E»? The big ones, the decision makers. Isn’t this a new stage fot the appearance Of totalitary ideologies? You ask and you ask well! Where stays now the extreme right wing? And the extreme left? And the center? And the third way? And the forth? And the speeding up without breaking, against the wall? Did you eat all the candy? Did you give them to friends? Did you get a stomach ache? melted and sticked to your fingers? How was it? But no one can be a dictator to a wall. What is that of countries? A death is a tragedy, several deaths, a statistic. Well drawn by and intern? seems like it says a lot? And how? With more data, more statistics. In an Island, isolated from the rest? And to where will we go? Many cultures, united by a one voice? Is it in Athens? In Istambul? In Ancara? ro or São Paulo? Where is it? And isn’t that more of the same representatives of the same as ever? But a new Europe wasn’t necessary. This one was enough! This one that never was!